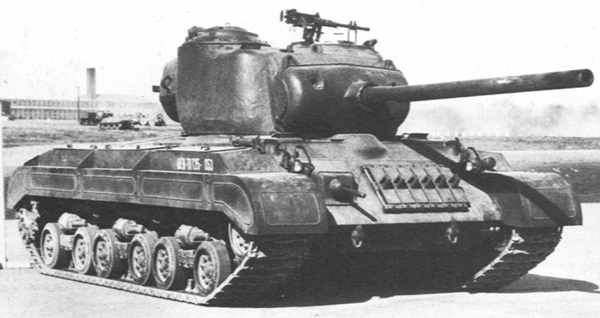 In mid-1942, when the Sherman had barely entered production, a successor was already on the drawing boards, ordered by the US Ordnance Department. This design was designated the T20, the first of an entire line of new mediums. The T20 tested new concepts, among which a new, more compact armor, a lower silhouette because of a new engine and the revolutionary Torqmatic transmission. However, because the transmission was the cause of many issues, the next in the series was the more conventional T22, followed by the T23. As the M4 was upgraded during the war, the need for a replacement decreased and eventually led to the development of the T25 and T26. The T26E3 was reclassified as a heavy tank and was the only one of the series to see action during WW2. It was standardized as the M26 Pershing. 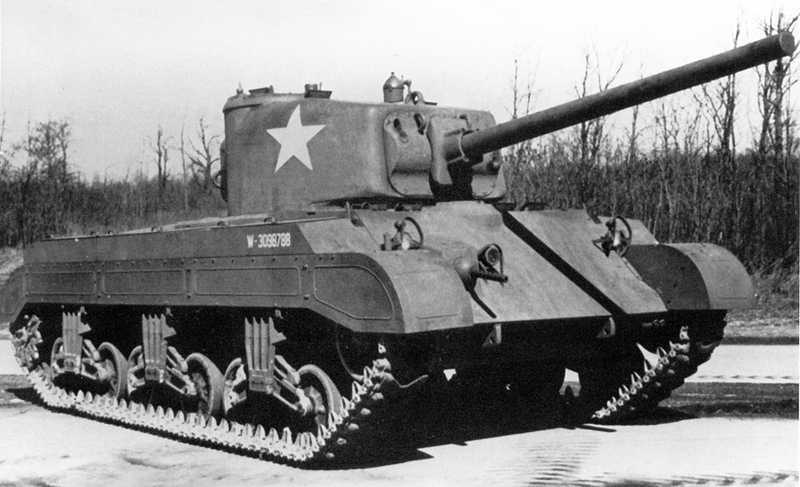 The T20 project was started in 1942 as an upgrade over the Medium M4. It retained the VVSS suspension and the drivetrain details. By the spring of 1942, even as the M4 production was in full swing, a mock-up of the T20 had been already produced. 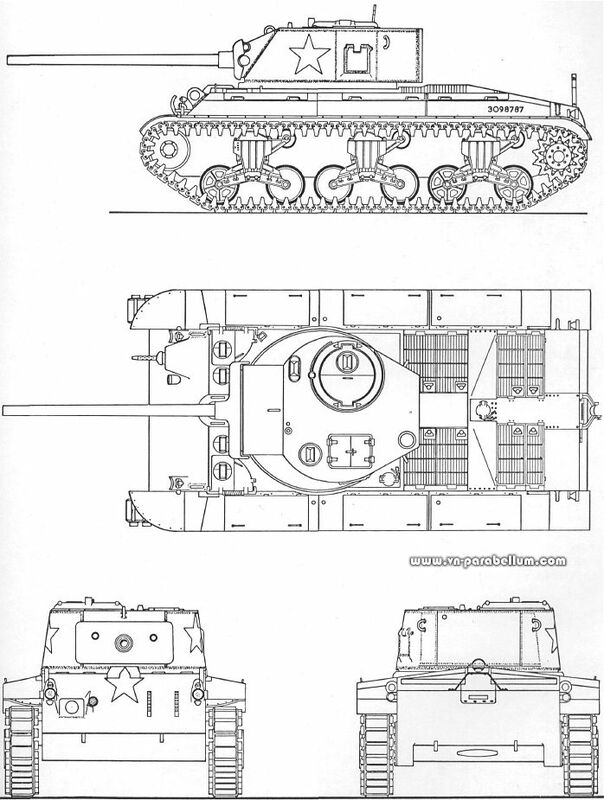 The T20 had a lower silhouette and a more compact hull, which made it easy to increase the armor of the vehicle. This size reduction was partly due to the new Ford GAN V-8 engine combined with a rear transmission and rear sprocket drive layout. This got rid of the high transmission tunnel that made the Sherman so conspicuous. The Ford GAN was initially meant to be a V12 with a similar layout and performances to the British Rolls Royce Merlin, but it was eventually turned into a smaller V8. The development of the T20 also led to the creation of the sturdier Horizontal Volute Spring Suspension (HVSS), which was later adopted by the Sherman. Another feature that passed onto the Sherman was the longer M1A1 76 mm (3 in) gun. 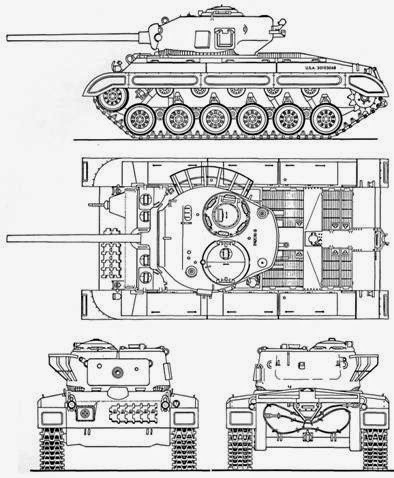 The T20 had 76.2 mm (3 in) of frontal armor. Because it was not wider or heavier than the Sherman, the T20 could use the same transportation methods as the ubiquitous M4, including railway cars and trailers. 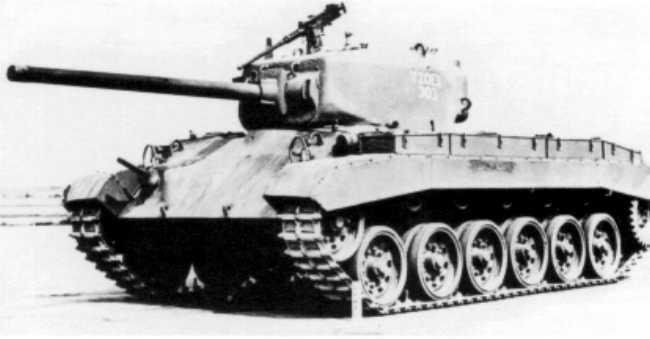 But, most importantly, the T20 was the first American tank to test the Torqmatic transmission, which was promising but had considerable teething problems. The T20E3 variant tested a brand new torsion bar suspension, which would be incorporated into 1944 tank designs like the M26 Pershing and the M24 Chaffee. The numerous problems caused by the Torqmatic transmission eventually triggered a return to the M4 transmission for the Medium Tank T22. It had the same Ford GAN V8 engine but coupled with the M4 type mechanical transmission. The T22 had the same hull, modified HVSS suspension, cast turret and long barrel 76 mm (3 in) gun as the previous T20. 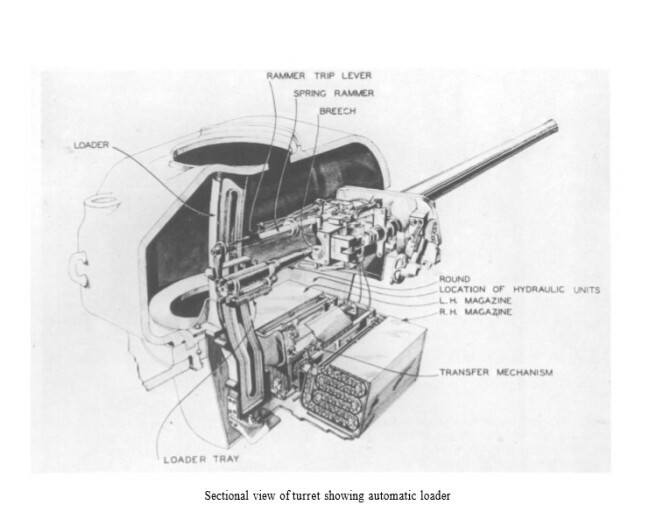 The T22E1 version tested an autoloader, which eliminated the need for a human loader, reducing the turret crew and allowing for a smaller turret. 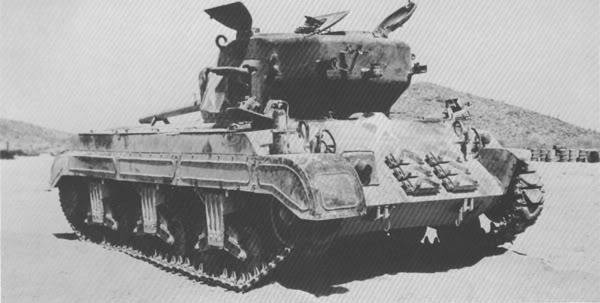 In 1943, however, there was no urgency to replace the M4, so the U.S. Army Ordnance decided to test several electrical transmission arrangements on the following T23. The T23 was a derivative of the T22 with the same hull, same turret, same suspension and drivetrain. The main difference was that the T23 project tested modern and alternative transmissions which were the trademark of this experimental series. The idea of an electrical transmission was not new at that stage, it had already been tested by Porsche in Germany for the Tiger prototype, with the advantage of giving a quicker response and more flexibility in torque when dealing uneven terrains. In total, six prototypes and 248 serial T23s were built. Ordnance Bureau declassified documents about the T23. 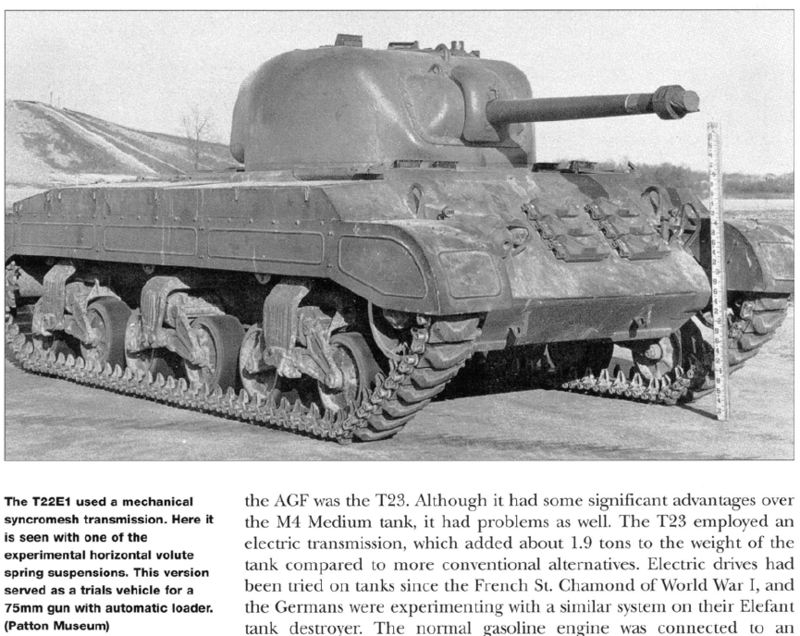 General Electric was in charge of its development and tried several variants and arrangements of the same system of coupling a generator to two traction motors that had already been trialed with success on the heavy tank T1E1. The Ordnance Department lobbied for its production and adoption. This lead to an initial series of prototypes and an order for a full series of medium tanks fitted with the new 76 mm (3 in) M1A1 gun. -The T23 series with the new M1A1 76.2 mm (3 in) gun. On trials in front of the Military Commission, the T23 soon earned positive reviews and also showed excellent dynamic performance with a small turning radius and top speed of 35 miles (56 km/h) per hour. However, the cannon vertical plane mechanical aiming system was faulty. Moreover, the turret was too cramped for three tankers. This required significant changes to the design. In particular, space was freed inside the tank in order to allow the crew more room. The length of the gun barrel was shortened by 5 calibers (38.1 cm) as well. After the changes were made, a new set of evaluation trials took place and it was decided to proceed to the development of new turret and gun mount designs. The first was based on the T79 Gun Carriage for the 75 mm (2.95 in) gun (with M4 and M6 periscopes). The second one used an improved T80 carriage with a complete redesign of the turret front casting. Ammunition storage (total) was 42 rounds for the two versions. Ultimately, the second version was preferred, as the turret looked more balanced. 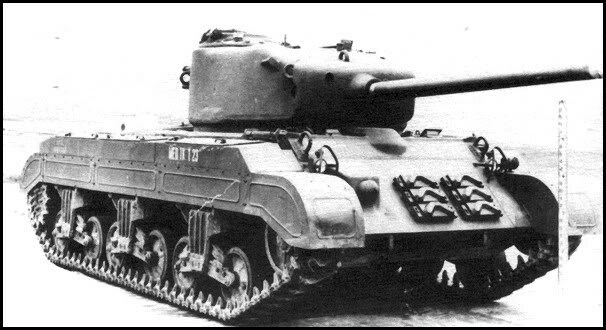 The second prototype of the T23 had its trial debut in March 1943, using the T79 carriage and the modified turret. The tests did not reveal more flaws and in May 1943, the Ordnance Department signed a contract for 250 production tanks. The hull was built using welded steel RHA plates. The front plates were 64 mm (2.52 in) thick, sloped at an angle of 47 ° for the upper part and at 53° for the lower part. The side armor plates were 51 mm (2 in) thick but flat. The rear armor plate was mounted at an angle of 10°, with a thickness of 38 mm (1.5 in). The interior layout of the vehicle was classical with a front-left driver’s seat and front right assistant-driver/bow gunner, who operated the cal.30 (7.62 mm) machine gun in its hull ball mount. Both crewmembers had their own sliding hatch. The fighting compartment was situated in the middle of the hull. The cast T23 turret had a ring diameter of 1750 mm (5’9”), fully compatible with any M4 Sherman turret. The turret crew consisted of the commander (rear-right), gunner (front-right) and loader (rear-left). The main armament was the 76.2 mm (3 in) M1 cannon in its M34 carriage. It had a coaxial 7.62 mm (0.3 in) M1919A4 Browning machine gun. A counterbalance weight of 800 pounds (363 kg) had to be added to the turret rear. The usual pintle-mounted cal.50 (12.7 mm) Browning M1920 anti-aircraft machine gun was mounted on the turret roof, for light AA and anti-personnel duties. The gun sight allowed a vision range from + 25 ° to -10 °. The maximum turret revolving speed was 24° per second and the electrical system had a manual backup. The T23 was propelled by a gasoline Ford GAP V8 engine, mated to an electric power unit which drove two traction motors, then connected to the transmission. No direct link was present between the main power unit and the gearbox, increasing their service life and allowing for much smoother gear changes on uneven grounds. The basic drivetrain elements were borrowed from earlier series and the M4. The suspension consisted of three bogies on each side, each with two doubled, rubber-clad road wheels sprang vertically. This was the Vertical Volute Spring Suspension (VVSS). The tracks were supported by three return rollers (brackets were attached to the top of the carriage). The idler/track tensioner was at the front, with the drive sprocket at the rear. The track consisted of T51 mild steel shoe links, measuring 406 x 152 mm. The design was classified “limited procurement” in May 1943, when 250 T23s were ordered. Oddly enough, the design was never standardized or issued to front line units. There was no M23. These production models featured the T80 turret, which was later also fitted to M4 variants. Production took place at the Detroit Arsenal from November 1943 to December 1944 (January 1945 according to other sources). Production modifications included the M1A1 76.2 mm (3 in) gun, 2-inch (50.8 mm) M3 smoke grenade launchers, peripheral commander’s cupola and a rotating hatch for the driver. The T23 was eventually never adopted for service because of its untried transmission system but also because the design had poor weight distribution and excessive ground pressure. 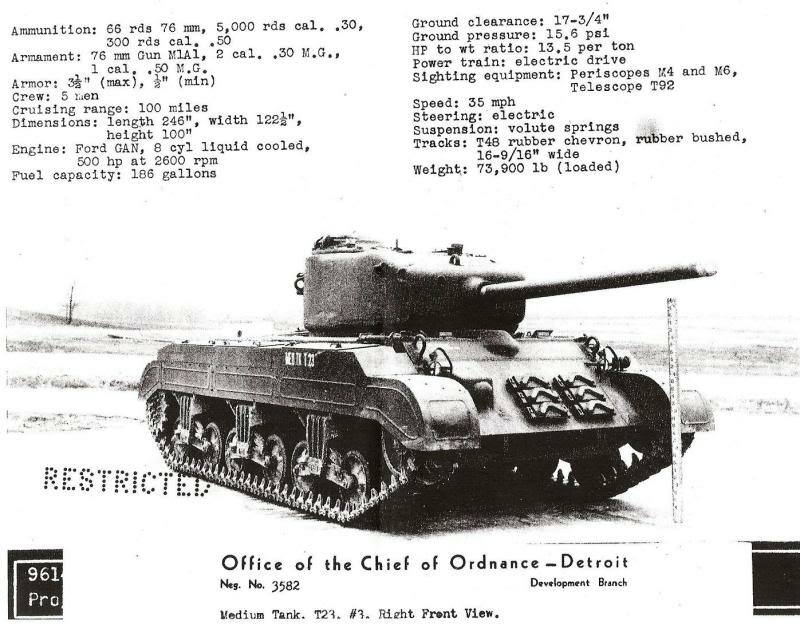 The T23 was only used on U.S. soil for the duration of the war for training purposes, just like the M2 Medium and M6 heavy tank. However, the T23’s cast turret was fully compatible with the M4 turret ring. The M4E6 (summer 1943) was fitted with the new cast turret and the M1A1 76 mm (3 in) gun, too long for the regular M4 turret. In an attempt to solve these issues, two variants were ordered. -The T23E3, which had torsion bar suspension. Completed and tried, it showed this suspension reduced the ground pressure by 20% compared to the T23. -The T23E4, which had horizontal volute suspension (HVSS). It was canceled even before the design was completed. An extensive testing program was carried out with the participation of T23s in Fort Knox. One T23 served as a pilot for trialing amphibious features, testing a fully sealed hull. However, in its first report, the Army considered the new T23 unsuitable for use in combat. Both maintenance issues and excess weight were to blame, condemning the whole lot to remain in the United States territory for training duties. The T23 did not fall into complete obscurity though. In April 1943, the Ordnance Committee recommended the construction of a T23 with torsion bar suspension. Designated T23E3, it was developed by Chrysler. It had six doubled road wheels on each side, each connected to an individual torsion bar suspension and 19 inch track shoes.. The first and last two road wheels were equipped with additional shock absorbers. 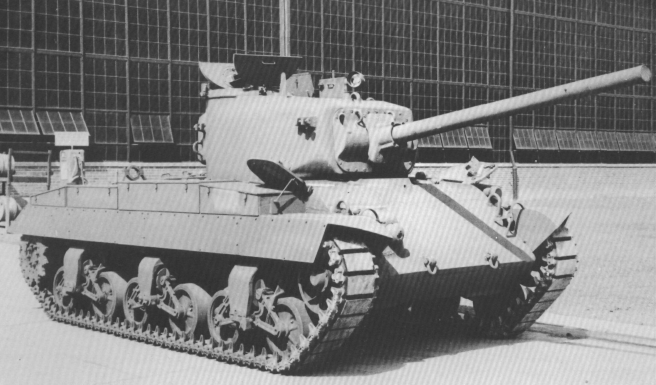 The T23E3 prototype was sent to Detroit Arsenal on August 29, 1944, and then sent for testing at Fort Knox. 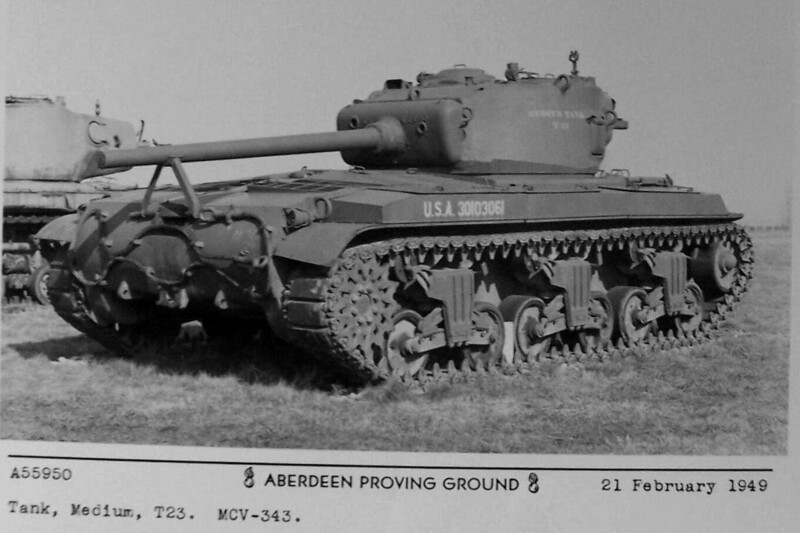 The T23E3 was also sent to the Aberdeen Proving Grounds for comparative tests with the T23. Despite the tests being a success, no production was initiated. The T23E4 turned to the HVSS suspension. The war ended eventually before the HVSS T23 could be accepted for mass production. There was also a tank hunter project, a self-propelled unit with a modified upper part. It would have had a 90 mm (3.54 in) gun fitted in a limited traverse open superstructure. The prototype was never accepted for service. There were also some heavy SPG designs on the drawing board, meant to be equipped with a 155 mm (6.1 in) gun M1 or an 8-inch (203 mm) howitzer M1. T22E1 with a synchromesh transmission, experimental HVSS and 75 mm (2.95 in) cannon fitted with an autoloader. Like always, excellent work! But The last picture on the left mentions torsion bar suspension. It looks like HVSS to me. Indeed, that was a regular T23 with the VVSS suspension.